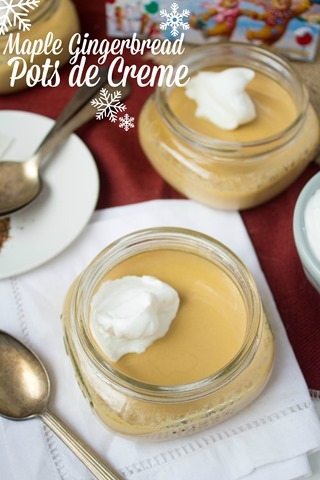 and the tasty Maple Gingerbread Pots de Crème recipe within it! You know what just screams the holidays to me? Gingerbread. It’s one of my favorite seasonal flavors, and I enjoy it this time of year in everything from drinks to baked goods. I recently realized I didn’t actually have any gingerbread-related recipes here on the blog, though – blasphemy! Time to change that. Let’s mix it up from the standard cookies though, shall we? Introducing: Maple Gingerbread Pots de Crème. 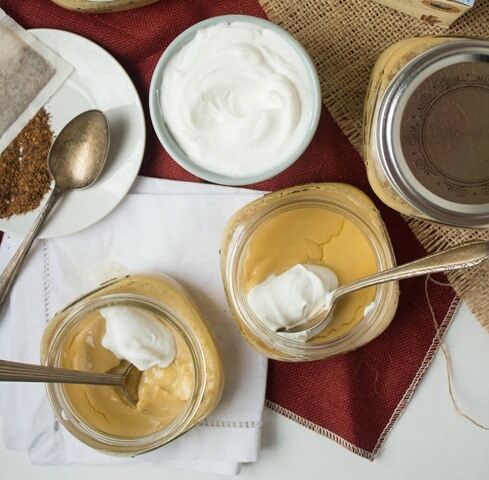 Have you heard of pot de crème before? It’s a French dessert, very similar to custard, but a bit looser. The name translates to “pot of cream.” Fun, right? 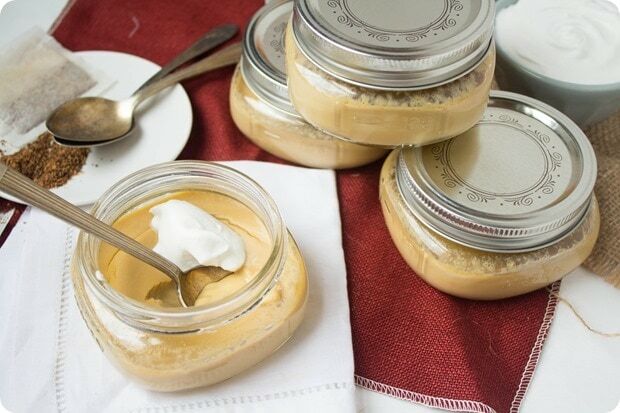 These pots de crème are easy to throw together, and make a super cute (and refined flour/refined sugar free) dessert for a holiday party! 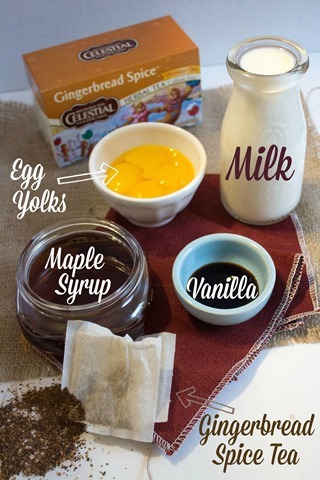 The gingerbread flavor is unexpected and festive, and pairs well with the sweet maple syrup. If you like, serve them with a dollop of whipped cream for garnish, which will offer a nice contrast to the sweet, spicy custard. I used this recipe for coconut whipped cream, sweetened with 2 tablespoons maple syrup. 2. Combine milk, maple syrup, and tea bags in a pot over medium heat. Bring to a simmer, then remove from heat. Allow to cool for 15 minutes, then remove the tea bags. 3. Place the egg yolks and vanilla extract in a large bowl. Pour the milk mixture into the egg yolks very slowly while whisking constantly to avoid curdling the egg yolks. Once all the milk is incorporated, divide the mixture into four 8 oz jars or ramekins. 4. Place the jars in a shallow baking dish, then fill the dish with hot water until it reaches halfway up the sides of the jars. Cover the dish with foil and bake for 50-60 minutes, or until the custard is set and barely jiggles when shaken. 5. Remove the jars and place in the fridge, uncovered, until cool. Serve when cold or cover with a lid and keep in the fridge for up to 3 days. Enjoy! What’s your favorite gingerbread-related food/recipe? Gingerbread Men are one of my fave cookies this time of year! I love pots de creme but have never made them. These look perfect and I can imagine how great they’d be with all the different flavored teas too! I know, I was thinking Sweet Harvest Pumpkin tea + canned pumpkin would be fun next time! I love gingerbread in coffee!! I saw this gingerbread cookie flavor at the store and I need to get it ASAP! I think this would be the perfect dessert for the annual Christmas Eve prime rib dinner my husband and I host! I pinned this post, so I’m planning to give this a try! Looks so delicious! So unique from most brownie and cookie recipes circulating the blogosphere right now, I love how creative (and fancy) you were… these are definitely restaurant style desserts! I’m a gingerbread cookie fan, but I might have to go buy some of these tea, sounds so festive! Yum! These look delicious, Anne! I love the short list of ingredients for these! Smart idea to use tea as seasoning – definitely got me thinking of some recipes I can create myself. Thanks for sharing! This recipe sounds relatively easy and yet sounds delicious! I always forget to break out my tea to cook with. Thanks for the inspiration! Where are the instructions for the recipe? It’s fixed – sorry, I switched to a new recipe plugin a few weeks ago and for a couple of my recipes there have been some errors in transfer! Enjoy the recipe! These look delicious. I see the ingredients but I don’t see the instructions on how to make these. Why can’t I see the full recipe with instructions? I want to make this for Thanksgiving!! Ingredients look good, but there are no instructions! 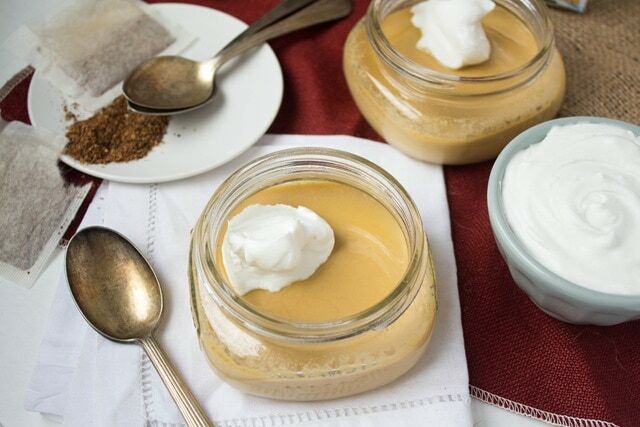 I cant find the instructions for this recipe – Maple Gingerbread Pots de Crème . Could honey be used instead of maple syrup, or maybe a combination of the two? I don’t have the CS gingerbread tea, but I do have Bengal Spice…a current favorite. I don’t think the flavor would be as on point with honey instead of maple, but you could try it!